Spiders and nuclear bomb factories. Are they connected? Imagine Usain Bolt grew four more limbs and decided to use them all. That’s what we’re dealing with here. As a teenager lots of things are scary. Boys, bodies, broccoli. But leafing through my old Smash Hits yearbook, under the question “Name your fears”, I have written: Spiders and nuclear war. I think that about sums up my teenage years. We lived in a semi-rural village, very close to an Atomic Weapons factory, which brought ‘When the Wind Blows’ by Raymond Briggs (1982 book, 1985 film) very close to home. The TV images of the Women’s Peace Camp at Greenham Common, just down the road, is imprinted on my memory, including the famous 70,000 women who joined hands to form a 14 mile human chain from Greenham to our neighbouring village Aldermaston. So that explains nuclear war. The village, which I returned to live in at the start of this year, is also surrounded by woods which, as I now recall, is home to grizzly bear spiders. Spiders which haunted my childhood, slept in sheds, entered bedrooms, colonised bathrooms. We rather quaintly call them garden spiders. But they don’t know this. They don’t know their place. They let themselves in and sit on the arm of your chair. They change the TV channel. They are huge. They are fast. Once, my father-in-law thought he saw a toy car race across the living room floor. It was a spider. Imagine Usain Bolt grew four more limbs and decided to use them all. That’s what we’re dealing with here. 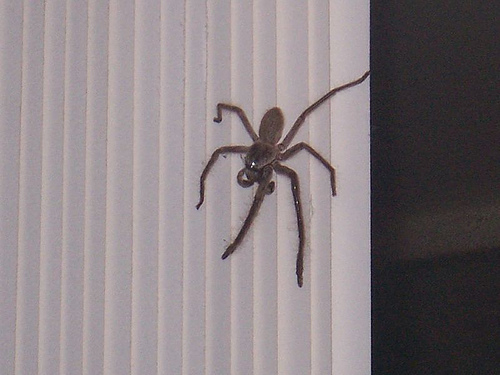 The spider in the photo above is clearly a huntsman, one of the few that stalked me in Australia. I probably saw less than ten big spiders in Australia, and the only deadly ones I saw were behind perspex. I don’t even associate Australia with spiders. Crocodiles, sunshine, freshly-caught fish, friends, the ocean, cockroaches, yes, but spiders? No. I would have taken a photo of a garden spider, but they’re too fast. Too sneaky. Too aware. 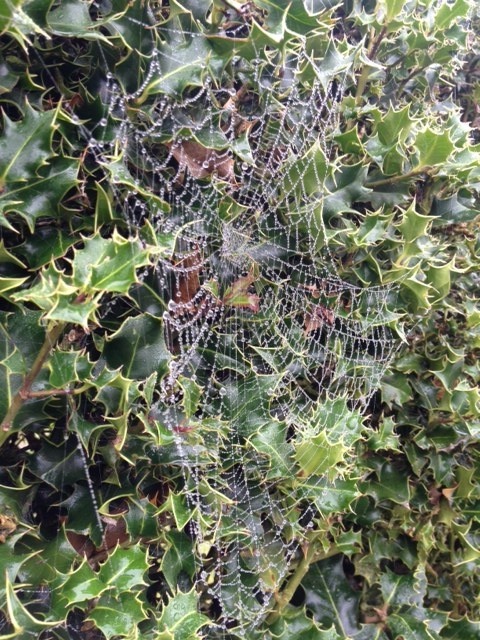 The other morning, as the first autumn fog descended, every hedge and bush on our way to school was covered in frosted webs. Like when a light shines through a window revealing that there is dust everywhere. I’m thinking of getting together a group of 70,000 women to form a human chain around the village to keep these bastards out. And as we battle our daily influx of garden spiders, I am beginning to wonder if my two primal fears are in some way connected. Is proximity to potential radioactivity creating monster, sprinter spiders? And what is it doing to my children? Fears remain the same however old we get. I eat broccoli. But do I fully trust it? No.